Umi Shoes takes pride in building real children shoes and not just floppy leather slipper socks or mini grown up shoes. All their shoes are designed with children’s feet in mind. They have set some pretty high standards and use only nappa and nubuck leather. In fact, they perform 20 quality control checks during the manufacturing process to make sure the shoes are made just right. They want all their shoes to be flexible, supportive, built to fit and will stand the test of time and wear and tear. They have Shoes for Babies, Shoes for Boys and Shoes for Girls and are they ever adorable!! This one is called the Riley and it’s a shoe for little girls. Love that pink and brown combo! This cute little sandal is called The Urchin. It’s so sweet. Umi Shoes sent me the Multi Colored Puzzle Shoes for my niece Avery. They are so cute!! Avery wears them all the time now and they fit her perfectly. They use European Sizing so Avery is a size 18. They have a conversion chart making it easy to figure out what size to get. The leather is so soft! The quality and craftsmanship that went into making these shoes is impressive. You can tell they really do take pride in their product. 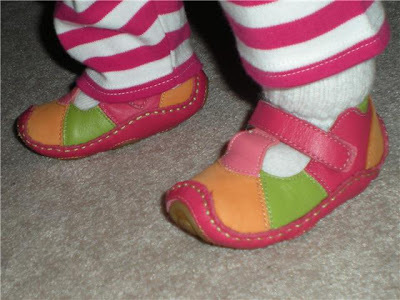 These shoes are pre-walkers so they mold to the baby’s feet and they are perfect shoes for crawling babies and ones just starting to walk. 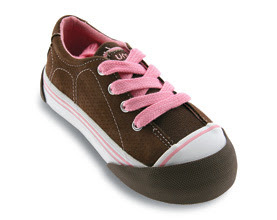 The rounded toes are great so the shoe won’t get scuffed up when your little one is crawling around. Laura has said that she gets numerous compliments on the shoes and everyone wants to know where she got them. The price for these particular shoes are $35 which is excellent. 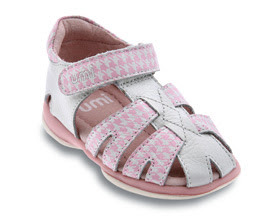 Umi Shoes are top of the line and are cute looking too! To purchase, please visit their website or find a store near you that carries them. Get 20% off any purchase until April 30, 2009 by using the code SPRING20 at checkout.